Talbot County Boating Access Site Improvements — BayLand Consultants & Designers, Inc. 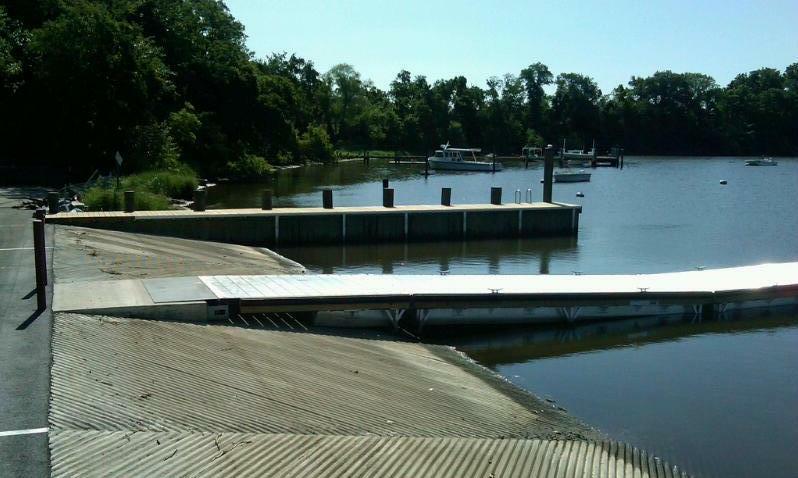 The Wye Landing Boat Ramp project consisted of the construction of an 80-feet by 56-feet concrete boat ramp, with 4 loading lanes, including removal of the existing boat ramp and piers; installation of a 56-foot fixed timber pier; installation of an 86-foot fixed timber pier; and installation of an 8-feet-wide floating pier. Solar powered lights were installed at the end of the fixed piers and a solar and wind powered flood light was installed adjacent to the ramp as part of the Talbot County Parks and Recreation ‘Green Up’ Program. There were also two 15-feet timber mooring piers with 10 new mooring piles installed and the parking lot was resurfaced. Overall, the Wye Landing Boat Ramp construction project came in on time and on budget. This project was a collaborative effort between the Maryland Department of Natural Resources (DNR) and Talbot County with funding from the Waterway Improvement Fund. BayLand performed the design and construction consulting services. The contractor for the project was George & Lynch. 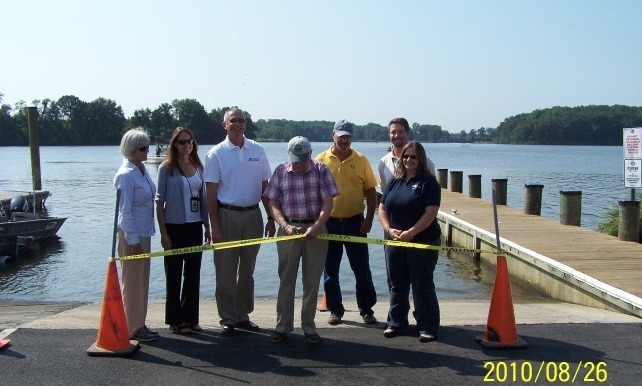 The Wye Landing Public Boat Ramp in Talbot County, Maryland reopened on August 28, 2010. The project was also featured in The Star Democrat Newspaper, Friday-Saturday, September 3-4, 2010. BayLand provided engineering; design; preparation of construction plans, specifications and construction bidding documents; construction supervision; and related services for boating access site improvements at Oak Creek Landing, a tributary of the Miles River in the Village of Newcomb. The boat ramp project consisted of the dredging and proper disposal of approximately 310 cubic yards of dredged material; construction of a 33-feet by 62-feet concrete boat ramp including removal of the existing boat ramp and bulkhead; installation of a 139-foot fixed timber pier with four mooring pier; installation of 18 mooring piles; installation of a 5-foot-wide ADA accessible floating pier; installation of 172 feet of timber bulkhead; installation of a marine pump out system; 250 square yards of new paving; and resurfacing of approximately 2,370 square yards of existing parking lot. Overall, the Oak Creek Landing Boat Ramp construction project came in on time and on budget. This project was a collaborative effort between the Maryland DNR and Talbot County with funding from the Waterway Improvement Fund. BayLand performed the design and construction consulting services. The contractor for the project was Rehaks Contracting, LLC.